Brussels Sprouts and bacon are the perfect side dish to accompany chicken, beef, fish, pasta, and pizza. Any time I see brussels sprouts with bacon (or pancetta) on a restaurant menu, I know my husband will want to order them. And for good reason, they are flipping delicious. Obviously, with breakfast/brunch being my favorite meal I had to make with into a breakfast combo. My intuition was correct. 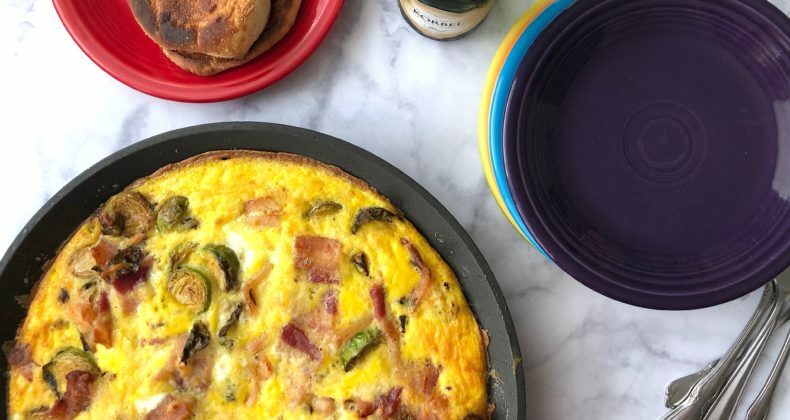 The last few years I have hosted a brunch with the women from my gym and this year I tested this recipe on them. It was a smashing success. There weren’t any leftovers for my husband and children to try so I had to make this again for them the following weekend. There weren’t any leftovers after they tried it so I had to make ANOTHER frittata so I could have the leftovers to reheat and enjoy all week. You could say in the last couple weeks I’ve made a whole lotta frittata! I prefer to bake my bacon with the brussels sprouts on top so they get nicely roasted. This is an extra step, but honestly, it takes only about 15 minutes and is completely WORTH IT. You could make this meal prep style and bake the brussels sprouts bacon the night before so in the morning all you need to do is give them a quick saute to warm them up before adding the eggs (I made it this way too). 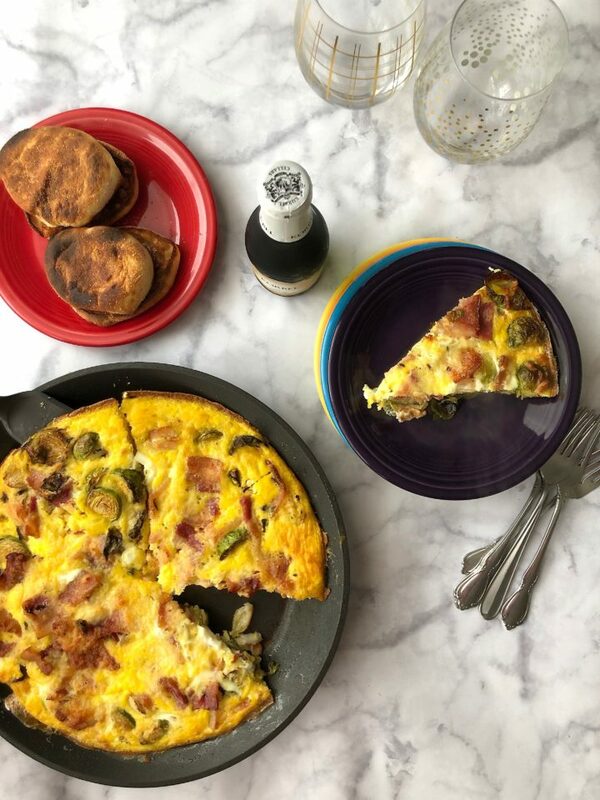 Grab some bubbly and get your brussels sprouts bacon frittata on. Level up your weekend brunch! Heat oven to 425 degrees F. Line a baking sheet with parchment. Lay bacon strips out in a single layer. Lay halved brussels sprouts over the bacon. Bake for 15 minutes or until bacon looks crispy and the sprouts are roasted. Remove bacon and brussels sprouts from baking sheet. Chop the bacon. Turn the oven down to 400 degrees F.